3M has created a home-application film that will rival dealership applied products for less than a tenth the cost. 3M has developed a spray-on film that may completely change the way we protect our cars from damage. Currently, new cars are always offered with a protective clear film that can be applied to the front of a car to protect the paint form chips and other damage. These type of films protect against stone chips, sand abrasion, and other road hazards and they work very well. In most cases that film is applied by a third party at the dealership prior to delivery. Cost typically ranges from $350 to $900. 3M’s new Paint Defender spray on film may make that a much harder sell for dealerships going forward since it costs less than a tenth of that. 3M began developing protective spray films as far back as the 1960s for helicopter blade protection. It now offers a whole host of car-car products, most notably headlight renewal kits. To develop this new spray film 3M tested 248 different compounds. The target was a product with great clarity, adhesion, and durability. The product also needed to be removable. After years of development 3M was able to achieve the balance it needed to make the Paint Defender perfect for consumer home use. The kit consists of three parts. A can of spray, a masking kit including tape and a small tube of wax, and a special trigger that helps the person applying the film achieve a continuous even spray pattern without any hand fatigue. In total the three parts cost about $44.00. The can of spray is capable of coating the leading edges of a hood and bumper. The cost of the can is $24.99 and additional cans can be used if the user wants to coat more of the car. Application is relatively straight forward. First the car is cleaned and a wax is applied that 3M supplies. Next the vehicle is masked to avoid over-spraying onto surfaces not intended for coating. For example, 3M does not suggest using the product on headlights. Then using the trigger and can together, the user applies three coats. Each coat is in a different direction to help achieve a consistent thickness. Once done, the masking is removed according to 3M’s easy instructions. The film then drives over a period of about 4 hours and the car can then be driven as long as it stays dry. Full curing takes a few days. After it is cured the coating is clear and smooth. The film is water based and can be cleaned up after application easily without special chemicals. The film will last over a year according to 3M and it does not require any special treatment, but hand-washing or touch-free car washes are recommended. Removal is easy, but it is important to have applied the wax that the kit comes with before application. To remove, the film is simply peeled back slowly from a corner while being wetted underneath. It will not come off on its own. 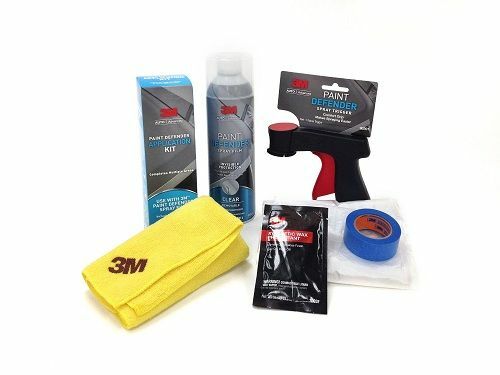 3M’s Paint Defender system is available now at AutoZone or on-line via Amazon. Note: Torque News was not compensated by 3M for this story, and has not yet tested the product.